See videos of parents and students, and read the letter online. BALTIMORE – The State of Maryland has failed to address the abysmal conditions in Baltimore City schools, leading to classrooms without heat and students wearing winter coats while trying to learn. The reality is that Baltimore City schools have been chronically underfunded by the State for decades in both facilities and educational programs. This has created a situation of such serious racial disparities that Baltimore City students’ right to an education is in crisis. For more than a decade, the State has been in violation of court orders that require sufficient funding to ensure that Baltimore City students have access to the quality education they deserve. Compounding matters, the state recently announced that a state commission studying the issue would delay its funding formula until at least December of 2019, and a new statewide proposal for improving school facilities is not likely to fully address the abysmal conditions of many Baltimore City school buildings. The net effect on both school facilities and school operational funding has led to learning disadvantages for Black and Latinx students and students from low-income families in Baltimore, leaving them unacceptably shortchanged. In a letter to Governor Larry Hogan on behalf of concerned parents and families, the American Civil Liberties Union (ACLU) of Maryland and the NAACP Legal Defense and Educational Fund, Inc. (LDF) expressed grave concern that the State was not addressing either the massive gap between current and constitutionally adequate educational funding or the immediate infrastructure needs of Baltimore City’s aging school buildings, which disproportionately harms students of color. The letter calls on the State to address this pivotal racial equity issue and ensure the State of Maryland fulfills its constitutional duty to students in Baltimore City. The ACLU and LDF represent the plaintiffs in Bradford v. Maryland State Board of Education, a case pending in the Circuit Court for Baltimore City on behalf of a class of parents of students attending public schools in Baltimore City. In 1996, the Circuit Court in Bradford declared that students in Baltimore City were not receiving the “thorough and efficient” public school education to which they are entitled under Article VIII of the Maryland Constitution. In later rulings the Court repeatedly found that the State was continuing to violate its constitutional duty to Baltimore City students, including providing insufficient funding for an adequate education. The ACLU has worked to ensure that the needs of students in Baltimore City – and other jurisdictions that have higher concentrations of poverty and majority Black and Brown student enrollments – are fully funded in the recommendations of the State’s Commission on Innovation and Excellence in Education, the “Kirwan” Commission. But with the recent announcement that the Kirwan Commission’s repeatedly delayed final report and funding proposals will not be fully considered during the 2019 General Assembly, the “adequacy gap” in Baltimore City will continue to grow and the constitutional violations will continue unabated. Black and Latinx students compose approximately 90 percent of Baltimore City Public Schools (BCPSS) student population. Year after year, the State fails to sufficiently invest in BCPSS schools. This has stifled the educational opportunity of thousands of Black and Brown children. 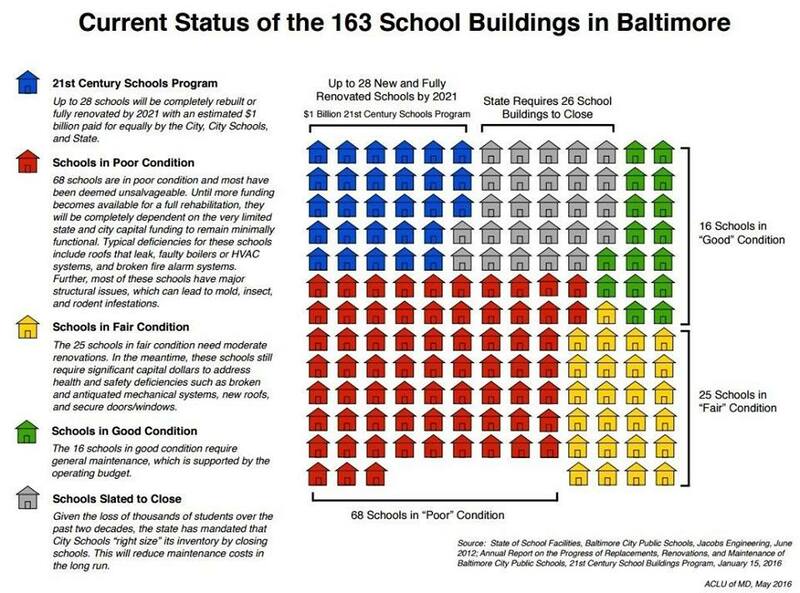 The shameful reality of the barriers created by unequal funding was on display last year when students in 87 Baltimore City schools – over half of all public schools in the City – attended class in rooms without heat or with limited heat. As a result, over the course of a two-week period, over 60 schools were forced to close, with thousands of students forced to miss days at a time. This past summer, numerous schools again were forced to close, because classrooms had no air conditioning. Nearly 40 percent of all BCPSS schools lack air conditioning. Baltimore City’s school buildings are by far the oldest in the state. Over 80 percent of the system’s 158 schools are in “very poor” or “poor” condition. The well-documented problems include lack of drinkable water due to un-remediated lead in water pipes, ancient boiler systems, roofs in need a replacement, and deficient electrical and fire safety systems. Moreover, the State’s own figures show that the City schools have an annual “adequacy gap” of at least $290 million in educational funding, and the Kirwan Commission studies show that Baltimore City needs at least $358 million in additional annual funding to support educational programs. Baltimore lacks the resources that other jurisdictions of comparable size use to supplement their school maintenance and construction budgets. This means Baltimore must pay for many emergency repairs and renovations to facilities out of its operating budget, which unavoidably diverts dollars from instruction. In addition, many Baltimore schools also lack the range of specialized facilities necessary to meet contemporary educational standards, such as computer and STEM-related facilities and art, music, and after-school programs. Taken together, this drain on already meager funding resources exacerbates the constitutional “adequacy gap” in an area where a majority of the students are Black, Brown and from families with low-income. In a letter sent to Governor Hogan, and distributed to State leaders, the ACLU and NAACP LDF ask that the State’s budget and any legislation on school facilities incorporate funding to remediate both the adequacy gap and the deteriorating school facilities in Baltimore — as the Maryland constitution requires, the Court has ruled, and as children in the city deserve. The groups offer to work with the Governor and legislative leaders to make that happen.